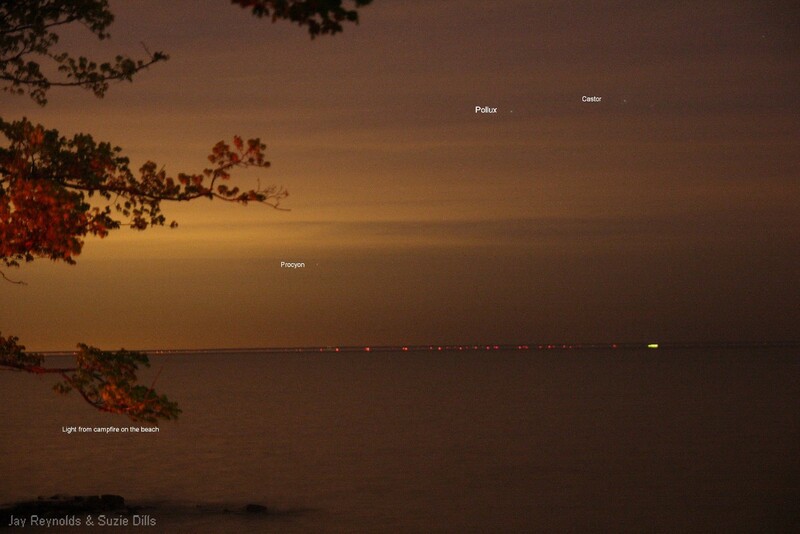 Lights of Canada, seen across Lake Erie from Ohio. For years, Suzie Dills has told me about seeing lights across the lake when she walks her dog at night. I always joked that she was making it up (knowing full well that she wasn’t). It wasn’t long before we looked on the map and determined that they were lights from Canada (or Narnia). Well, I’ve always told her to call me when they are happening, Sunday night (May 5) was the night. When I arrived at Huntington Beach, I knew exactly where to look, but didn’t really see much. (I know what you may be thinking.) I saw a few lights but not the lights, cars, houses, and small children that she’d planted in my anticipation. But when I raised my binoculars… “Ole Eagle-Eyes Suzie” was correct! The horizon was littered with many, many red lights and the occasional building light as well. This easily spanned 30 degrees along the horizon. You could clearly make out the thermal boundary layer above the lights. Video would show the scintillation of the lights. It was terrific to see this across the lake on such a grand scale! Those of us old enough to remember antenna TV, Sunday night would have been great fun to pick up signals from Toledo, Detroit, and maybe even Erie, Penn. (only to learn they are watching the same “Lost in Space” I was watching). Higher up, through the haze, you could see Procyon, Pollux, and Castor taking their final bow of the spring; farewell winter friends, we’ll see you soon enough. 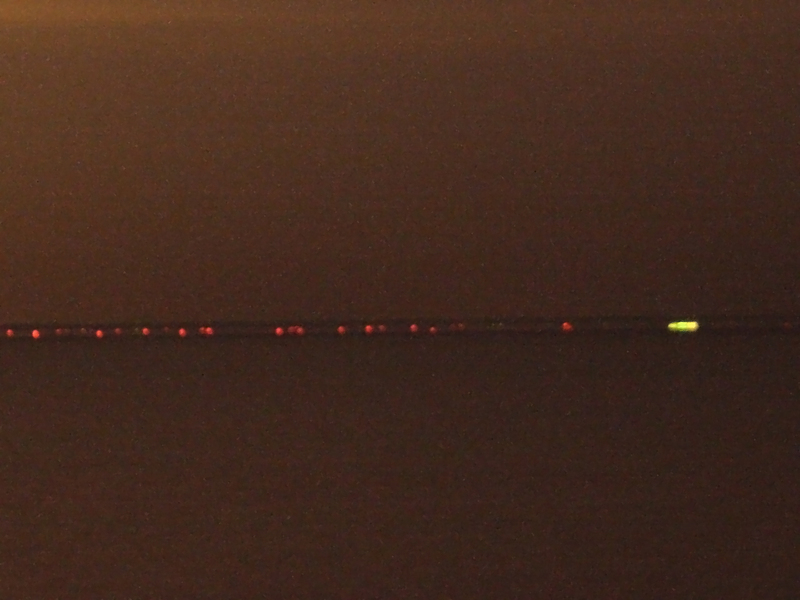 The warmer air temperatures had led us to this optical refraction across Lake Erie the previous two nights. This happens in the spring and autumn when the lake water temperature is radically different than the air temperature! Cold lake temps (43 degrees) and warm air temps (65 degrees) set up a trap/ducting which bends/refracts the light over the horizon. The effect is somewhat similar to a hot summer day when blacktop has that mirror/mirage look to it. The pavement is very hot, the air is much cooler. The measured distance from Bay Village to Canada is approximately 50 miles. Because of the curvature of the Earth, we are usually limited to approximately 16-20 miles line-of-sight. Bottom line, science is fun, nature can fool us into thinking “a bridge to Canada would be half the cost we thought,” and Suzie has binocular eyes after all! Jay Reynolds is the CAA’s Observatory Director, astronomy instructor at CSU, and well-known as a NASA Solar System Ambassador. Stars above, Canada’s lights below. This entry was posted in Uncategorized and tagged atmosphere, Earth Science, Lake Erie, northeast ohio, northeastern ohio, refraction, weather. Bookmark the permalink.